Hi guys, in this tutorial today, I will show you how to change your voice in Google Meet with a Voice Changer Software. With this combination, you will be able to change voice during call in Google, from male to female, female to male, robot, and many other voices. Amazing, right? Google Meet is a new product of Google for video calls. The platform mainly aims for business use of all size. Is Google Meet free? Yes, it's free to a certain number of participants and size of the business. Google Meet has higher number of participants that can join the call at the same time, up to 100 based on which plan the customer is using. On the other hand, the Classic Hangouts only allows up to 25 participants. For the detailed comparison between the two, you can follow this official link of Google to read more: Google Meet vs Hangouts. AV Voice Changer Software Diamond is the voice changer for PC that can change voice from male to female, female to male, robot, animals and many other voices. Just connect the software to Google Meet and you are ready to have fun talking with different voices. 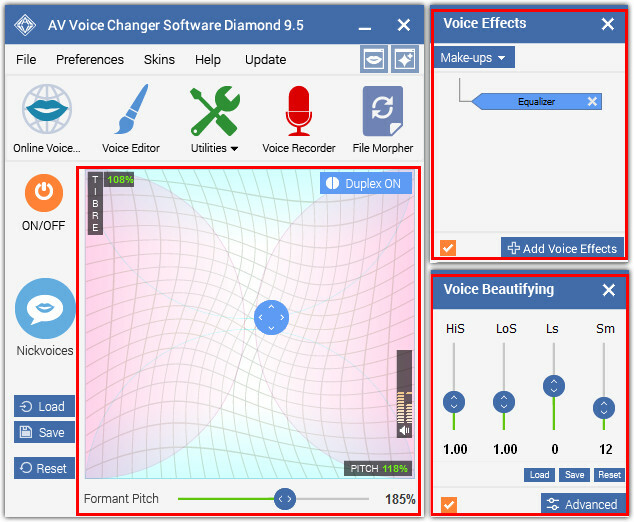 Moreover, it;s not just a voice changer real time, AV Voice Changer Software Diamond can also help you edit audio with Audio Editor, morph vocal of pre-recorded audio files and then convert to different audio formats with File Morpher. There are other interesting features such as Voice Comparator, Voice Analyzer, Parody Maker, etc. along with the library of more than a hundred voice effects, background effects and more. The best voice quality, which is as real as possible with different settings. I have also used other programs, but the quality is not as clear and sounds real as this voice changer software. Interface with detailed features. It took me only a few seconds to get used to the basic features and a few days to explore the other features. When combining all features, the sound output is amazing. It can do audio editing: I can record my changed voice, edit/cut/split/add effects and then save or convert to many different audio formats. This will be the main feature that you use most of the time: change voice in just one click. These are the ready-to-use presets to help you conveniently change your voice effortlessly. Isn't it cool that there are so many to choose from? I'll tell you, the other programs really do not have this much presets. This one is the bomb! Many effects to choose from and the effects are very real. 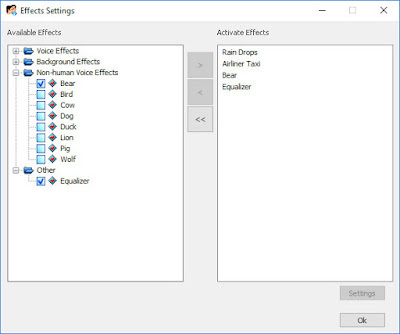 You can choose Voice Effects, Background Effects, Non Human Voices and Other. Non Human Voices: when you talk, you will sound like a bear, bird, cow, dog, etc. Other: this is the one that I use the most - Equalizer. This one enhances your voice by changing different Hz values. It makes dramatically changes to the vocal and very effective. Did you know? 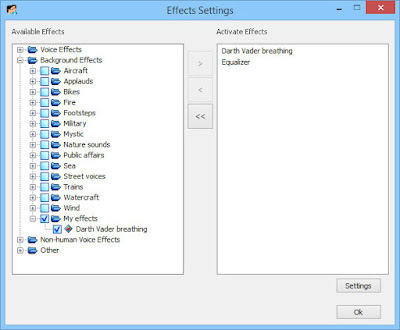 Voice Effects feature also has ready-to-use presets which are called Make-ups (Breathy, Hoarse, etc.). 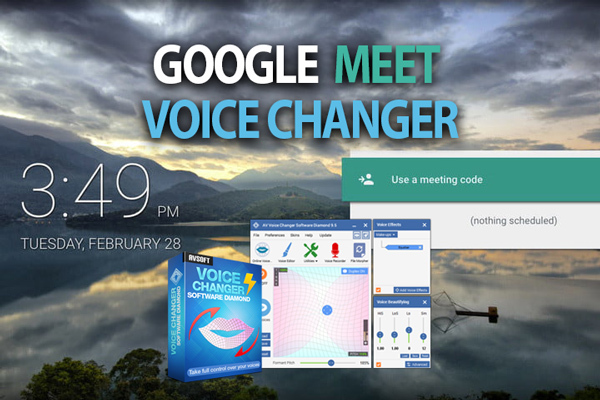 This is very convenient when you change voice in Google Meet, just a click and have the desired effects. 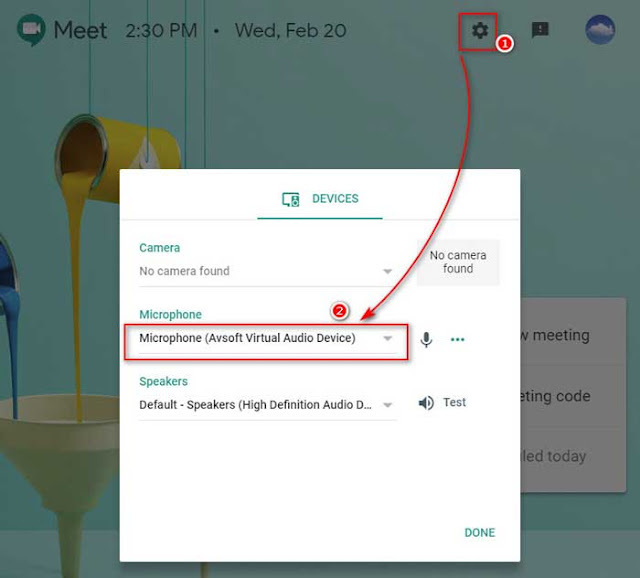 To change voice in Google Meet with Voice Changer Software, simply connect the two as below steps. - Login to your Google account. - Select Microphone (Avsoft Virtual Audio Device) (2) as your main Microphone. You are ready to make a fun talk already. Just join a call and see how it goes. - Voice Changer while Calling: To see how to connect with other chat programs like Skype, Discord, etc. 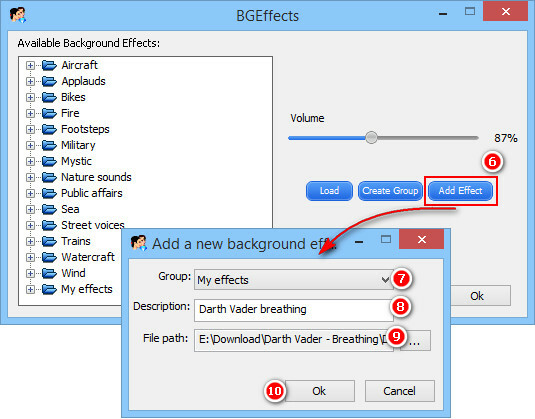 - Funny voices: Follow these tutorials to change your voice like Darth Vader, Yoda, Chipmunk, etc. - Voice Changer Tips: The useful tips to help you optimize your voice output better. 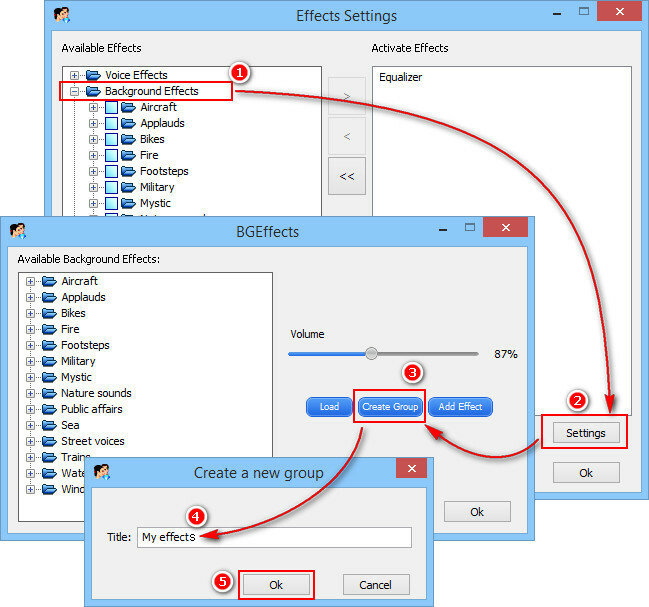 For example: how to make use male to female voice changer, add background effects, how to use nickvoices, etc. 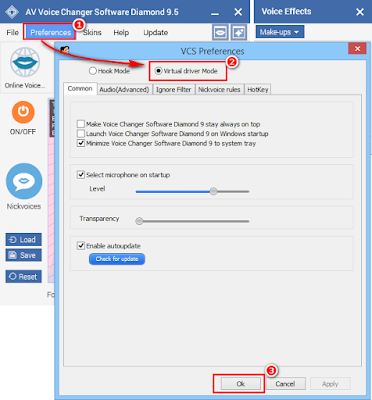 By simply connecting Discord with AV Voice Changer Software Diamond 9.5 (VCSD9.5), you will be able to change voice on Discord for a real time talk, record your gaming conversation, realistic and high quality voice algorithm, edit and convert to files, and I'm sure this gaming experience will never be forgotten. Discord is completely free to use, and there are many outstanding features, I admit. Check out the comparison below to see what I mean. Although this is from their website, but when making some research into this, I believe it's quite true. "In the future there will be optional cosmetics like themes, sticker packs, and sound packs available for purchase. We’ll never charge for Discord’s core functionality." - Discord. This software can be considered as the best voice changer for Discord at the moment, in my opinion after using a few ones. I know you may think differently, but anyway, let's take a look at it first. First of all, you can use it as a female voice changer for Discord, or record your voice to audio files, convert file format and many other useful features. 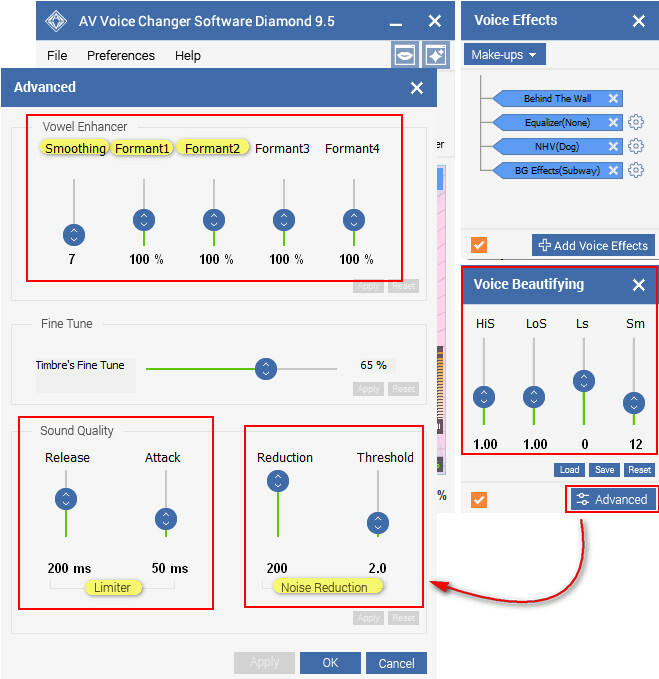 The software's name is AV Voice Changer Software Diamond 9.5, a famous brand and the current top leading software in the market of Discord voice changers. You can sound just like any famous celebrity, change voice from male to female, boy to girl, even imitate others' voice with voice comparator. What's new in the latest build 9.5? - Pitch and Timbre are designed into graph form, correlated to change age and gender of your voice when moving the pointer. It gives better visual control over voice morphing and modification. - Voice Effects and Voice Beautifying are now located to the right, always visible for better management. - File Morpher is what makes it stand out from the crowd with the ability to morph and convert audio files. Now the feature is available in two mode: Full Mode and Quick Mode. This is the easiest and quickest way to use Discord female voice changer function and get ready to talk in real time in just one click. Nickvoices are the ready-to-use voice presets built in the software - inspired by the word Nickname. You will have more than 60+ options to choose, from male to female, female to male, animal voices and also non-human voices. Remember, Add-on Store always has free and new Nickvoices updated regularly. There are many interesting ones there, Justin Bieber, Batman, Darth Vader or Morgan Freeman, just to name a few. 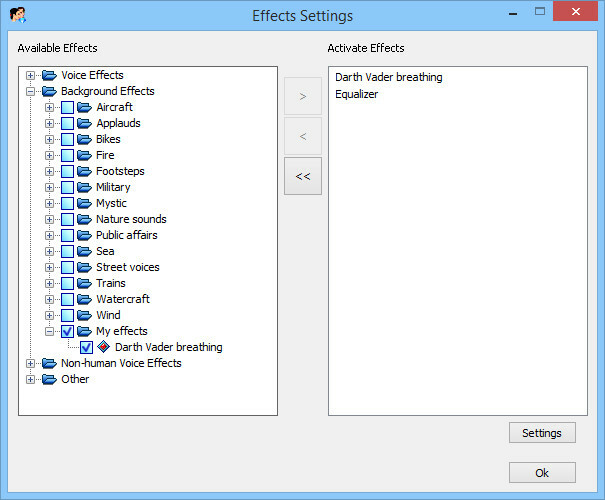 For even more choices, you can adjust the settings of Voice Morpher feature. This is also the most creative way to change your voice in Discord, which can give you some unexpected brilliant results. By the way, this is also the main reason why I consider the program as the best voice changer for Discord at the current time. The feature is too good compared to other competitors. - Pitch and Timbre graph: change the age and gender of your voice. Remember to use Format Pitch to achieve a more natural result. - Voice Effects: add vocal, audio and background effects to your voice and there are also Make-ups presets along with Custom (Equalizer) to modify your voice. There are many great voice effects for Discord. - Voice Beautifying: control and enhance your vowel as well as sound quality. 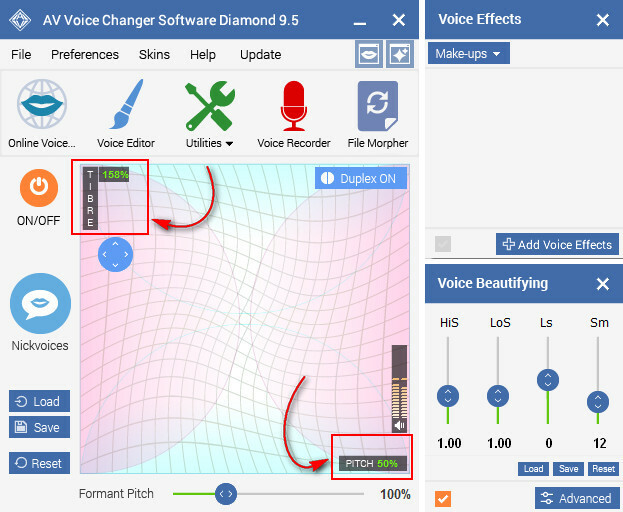 In the article, I also made a collection of other tutorials to use Voice Changer Software Diamond 9.5 with other VoIP programs. In case you want to use a different program (Skype for example) other than Discord, then it will be a good help. 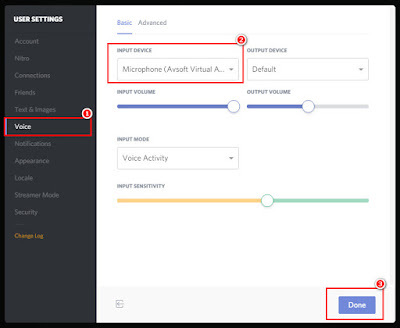 In fact, when using Discord voice changer PC, you will have to connect the Voice Changer Software Diamond 9.5 with Discord, whether it's the PC or Web version. But let me tell you, it's only a click to connect the two programs! Do you believe me? Check it out below. In web version, it also applies the same steps just as the Discord voice changer PC version. - Select Microphone (Avsoft Virtual Audio Device) (2) as Input Device. Now, the two software are already connected. Just talk in the mic, you will be able to change your voice in real time for online chat. Open both software at the same time and call your friends for some fun gaming. Enjoy your games! Want to see an example? Check out this video when using AV Voice Changer Software Diamond to imitate some Dota 2 heroes. Learn how to change your voice in Discord from male to female, with variations in age and characteristics. 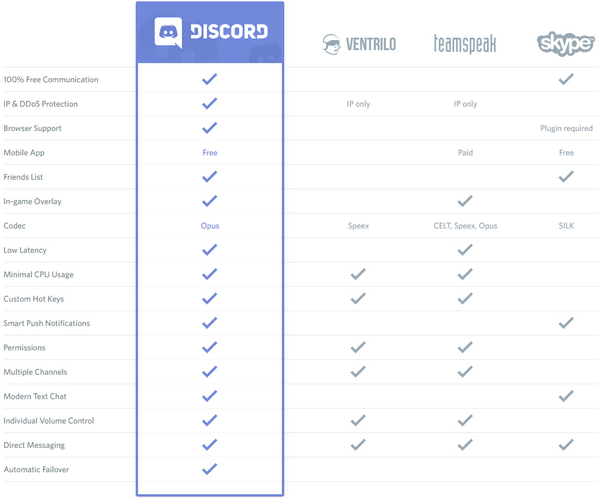 Not only a voice changer for Discord PC, for other VoIPs as well! Hope that you find this tutorial useful. 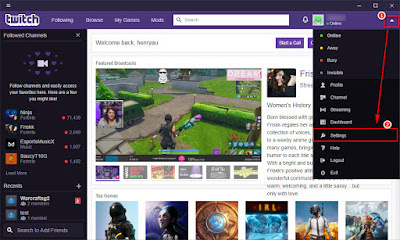 How can a streamer improve a streaming section to be more enjoyable? It's a hard question, I know that feeling too, buddy. Twitch voice changer for streaming is a good way for me. There are many things you can do on your Twitch streaming, but this voice changer software will completely change the way you stream. 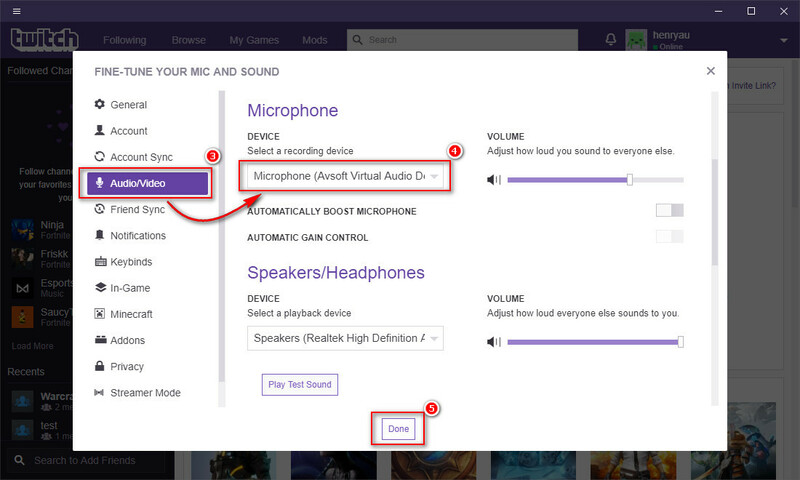 In this tutorial, Call Voice Changer will show you how you will use this Twitch voice changer for streaming. Just like what it's called, you will have fun while streaming with the voice of Chipmunk, Morgan Freeman, a sweet lady, or any voice. What is Twitch voice changer? I know, you are wondering what kind of software that we are going to use in order to change voice while streaming. 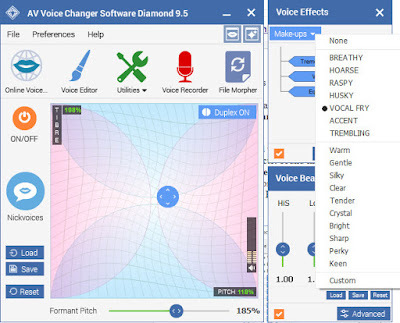 Here is the answer, this is one of the best software that I could find on the voice changer market - Voice Changer Software Diamond. This is the software that can change your voice in real time, mimic a female voice, a grandpa, sweet woman, baby boy, even famous voices of Morgan Freeman, Chipmunk, etc. Moreover, you will also be able to edit audio files with the built-in Audio Editor, File Morpher, and many other tools to assist both audio editing tasks and voice morphing tasks. Read more. So, how are we gonna use voice changer for streaming? 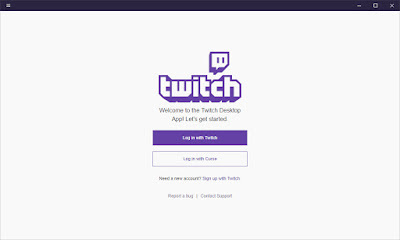 In this tutorial, I will show you how to connect Voice Changer Software Diamond 9.5 with Twitch Desktop voice and video calls. 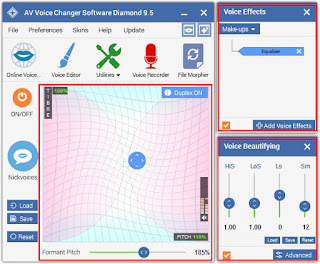 First of all, you will need to choose the mode in Voice Changer Software Diamond. - Choose Virtual driver Mode (2). 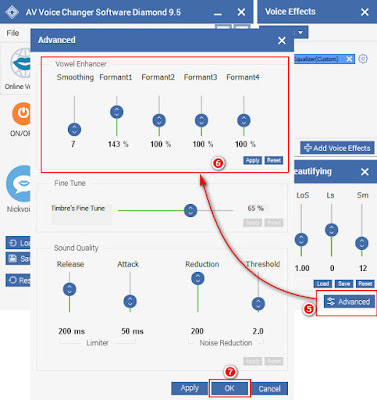 With Virtual driver Mode, the software will be able to focus solely on the program it is connected to, therefore, the sound quality can be improved tremendously. For example, it's more sensitive to the input and can capture most of the sound from your microphone. And now, here is the interesting part. Change your voice to any voice you want with the Voice Changer Software Diamond. There are many ways, and you are free to adjust however you like it. However, let's start with the basic of basics: Nickvoices. 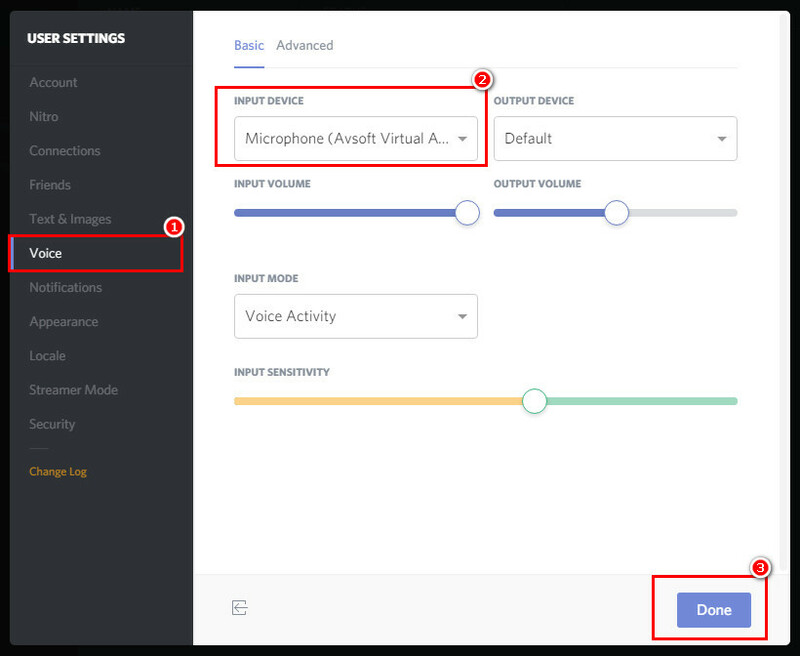 Nickvoices are one of the main settings you will usually use when changing voice. With just one click, you can change your voice based on the built-in ready-to-use voice preset that you choose. For example, you can change your voice to a boy, a middle aged man, grandpa, a baby girl, a sweet girl, grandma, etc., even animal voices. Okay, you have been doing great. After trying a few nickvoices, how do you feel? It's good, right? But did you know? You can even adjust more settings to your own taste with various voice settings, voice effects, background effects, voice beautifying features, etc. Wait a minute, don't panic with those words. It's actually very easy to follow. Once you know that these buttons are for, things will get pretty simple, perfect for a Twitch stream with various unique voices. First of all, see that graph at the main panel? - This is the main part, sometimes, you just need to adjust this setting and it's enough to achieve a voice you want. - Pitch is how you will sound: higher or lower. Thus, you can control the gender of your voice. - Timbre decides the age of your voice. - Format Pitch: only adjust when necessary. This is a tool that makes your morphed voice to be more natural in case it sounds robotic. Got it? That was the main part. Now, to the decoration for your voice. - No need to talk much about this feature, right? You can add voice effects, background effects and many others. - Each effect can be adjusted so that you can get the best suitable according to your need. Perfect for a squishy Twitch streaming section. 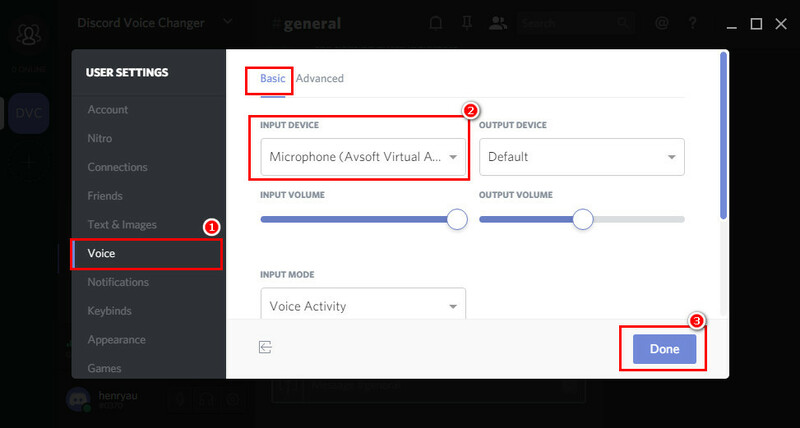 This is the feature that can help you improve the voice even better. Making changes to the four sliders can lead you to various characteristics of your voice. For example, making it more creaky, soft talking, rough, dry, etc. I hope that you get the gist of this software now. Just try a few times and you know how to do it. Still not clear? No worries, check out this tutorial to see how to change your voice male to female. You will see the settings explained in more details. 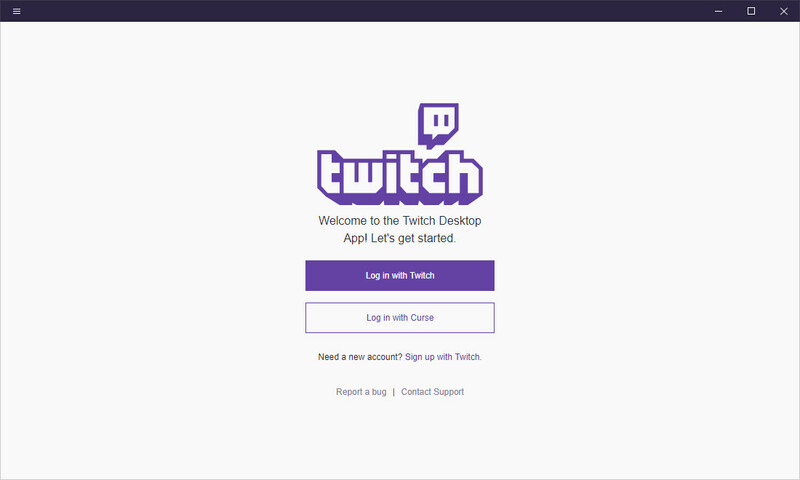 - Launch Twitch desktop app and log into your account. - After logging in, you will be at the main panel. See that button at the right corner? - In Microphone section, select Microphone (Avsoft Virtual Audio Device) (4) as your Device. Starting from this point, Voice Changer Software Diamond will be the main input for your Twitch stream. 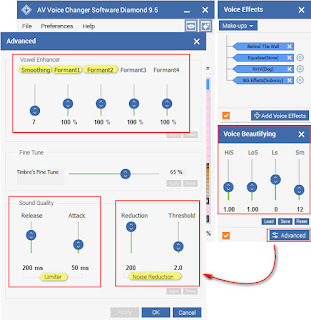 Whatever voices you use in Voice Changer Software Diamond will be your voice when talking in Twitch. And now, it's time to show your new voice to the online community. Make voice calls with Twitch and have fun with your games. Incredibly fun, I mean!!! "I am your father!" 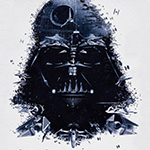 Say it loudly and confidently with a sonorous bass voice - the voice of Darth Vader. If you are a true fan of Star Wars, then this is the coolest Darth Vader voice changer with even Darth Vader breathing sound that you should check out. "Is it Darth Vader talking? Yes, dude. Welcome to the dark side." Make the best prank calls and chat conversations with your friends and family. Spice up the mood with a little fantasy of Star Wars, why not? 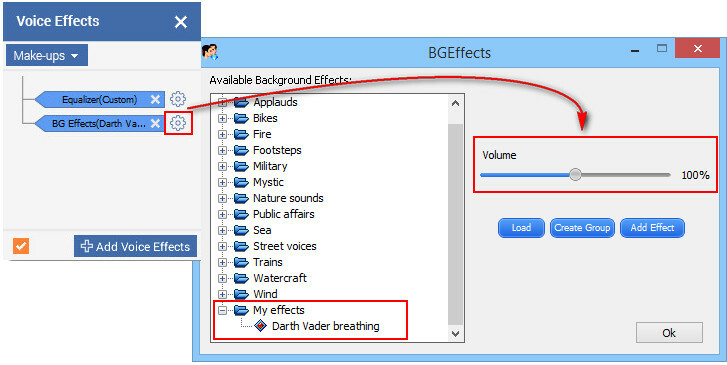 As we have received so many requests to make a tutorial on how to change voice to sound like Darth Vader. So, here it is, Call Voice Changer brings you 3-simple-step tutorial with special effect as a bonus: breathing sound. You will easily join the dark side, use the force to speak just like Luke's father (lol 🌟) in both online chat conversations and offline voice changing projects. >> Use Voice Changer For Discord with Darth Vader voice, why not? This amazing software allows you to change your voice to any voice you want in real time. What's more, you will have a built recorder, audio editor to cut/split/copy/add effects to audio, file morpher to convert file format in batches and many other awesome features integrated all-in-one. 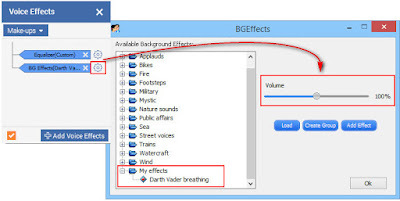 In this tutorial, you will know how to sound like Darth Vader and add the effect Darth Vader breathing for you online calls/audio records or any audio project. By choosing this mode, the software will focus on the software it is connected to. 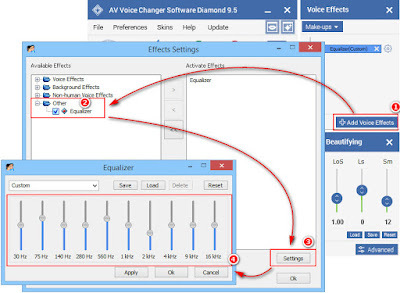 For example, when you want to change your voice to talk in real time on Skype, connect AV Voice Changer Software Diamond 9.5 to Skype with this mode, it will focus solely on Skype conversation to have the best voice quality. - On the Pitch-Timbre graph, move the pointer or use the arrow keys on your keyboard to adjust the values. In our case, we found Pitch 50% and Timbre 158 % best imitate Darth Vader voice. Remember, this is just that basic fundamentals of the voice. You will adjust more to get the desired voice. Note: Result will vary from person to person. You can adjust a little bit to get the best result. 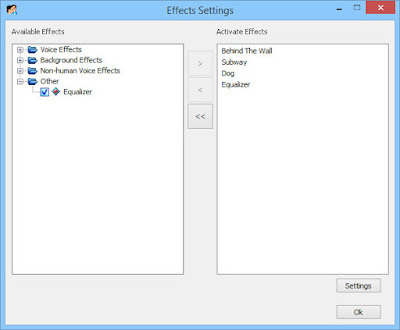 - In Voice Effects panel, choose Add Voice Effects (1). - In Effects Settings window, tick on Equalizer (2) in the Other drop-down list. 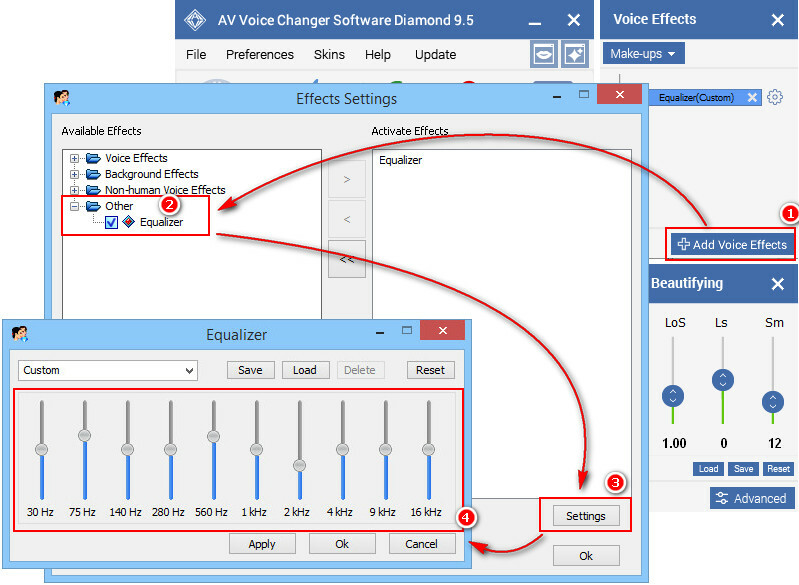 - Select Settings (3) to adjust Equalizer values. - Adjust each slider as in the panel (4) and then click OK.
At this point, your voice will sound pretty much like Darth Vader already. Now, we will improve the sound quality with Voice Beautifying. Alright, everything is great by far. Now, we will go to the next part, add effect of Darth Vader breathing. First, download the free effect at Audio4fun's Add-on store. 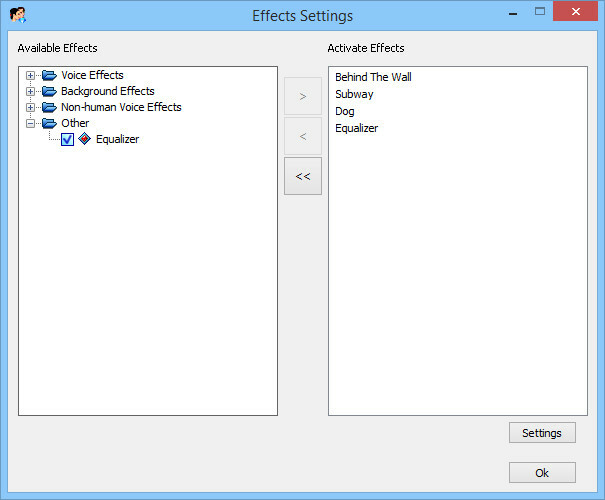 - On the Voice Effects panel, select Add Voice Effects to open Effects Settings window. - Select Background Effects (1). When selecting the Background Effects, Settings button will be visible to choose. - Type in the Title (4) of your new group. - Select Add Effect (6). - Select the Group (7) you just created above. - Enter Description (8). Remember: this will appear as the Effect's name in the software later. - File path (9): select the file you just downloaded from Add-on Store. Congratulations, your voice is now fully changed into Darth Vader and it also has the breathing sound effect. Impressive, right? Moreover, if you want to configure how loud the breathing sound effect is, you can click on this icon to quickly adjust the Volume. Are you ready for a quick call? This is an example that we made just for fun. Do not cringe in any case, hahaha. Male to female voice changer software is a tool to change voice male to female for any user to have fun in the cyber-world. You can change voice and make it sound higher, from a boy to girl, a guy to a woman, a grandma, a lady with a beautiful voice and many other possibilities, even imitating famous celebrities. - Huge library of voice effects, background effects and more. - Total control of the fundamentals of your voice. 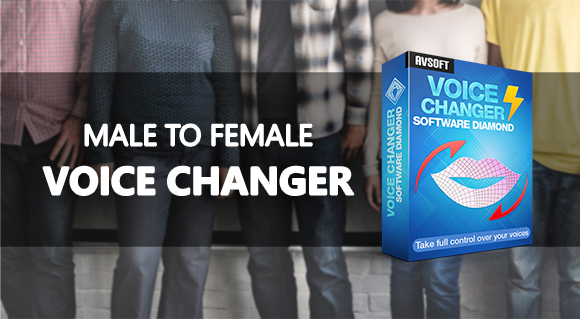 One software to solve all your needs for a male to female voice changer. Amazing, isn't it? 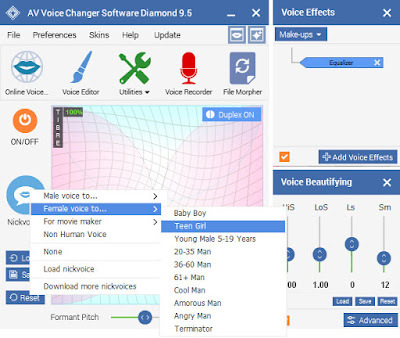 The male to female voice changer we are referring to is called AV Voice Changer Software Diamond 9.5, and this software can be considered as the best in the voice changer market at the moment. With this amazing software, you will be able to change voice male to female, sound like a sweet girl, a woman, a baby girl, even a grandma. What's more? You can also add voice effects, background effects to it to make your voice sound like breathing fast, weak voice, along with the background contexts such as the beach, traffic jam, forest, etc. The possibilities for combinations will make you surprised. Along with male to female voice changing function, it can also help you in multiple audio tasks. - Record a voice message in female voice or normal voice, your choice. Last but not least, getting to know how to use this software is extremely easy. Any newbie can master the use of different features within minutes. From just a look at the main panel, you will see the main features, move around a bit and you are good to go. Did you know? You can use this male to female voice changer in a real time talk! Yes, you read it right. It can be connected to other online chat program and instantly transform your voice while you are talking. The other side will hear the female voice. When using this mode, the voice changer will focus solely on the software it is connected to. Thus, the sound quality will be a whole lot better compared to not using. This is your quickest way to change your voice with just one click. Nickvoices are the ready-to-use voice presets built-in the software for quick usage. 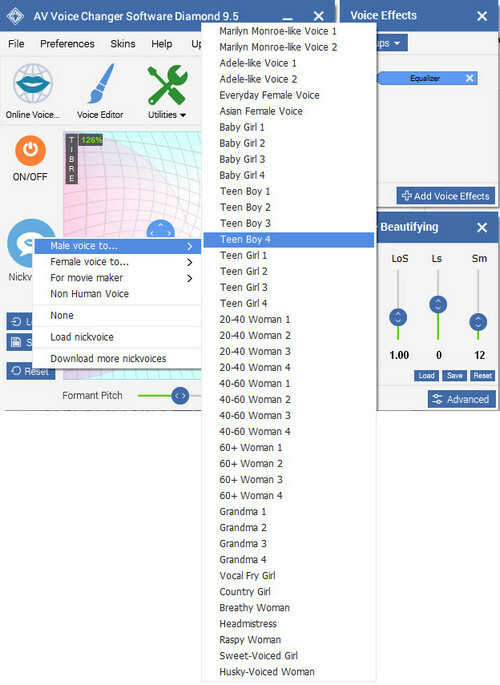 As you can see in the photo, you can change male voice to female with just one click. 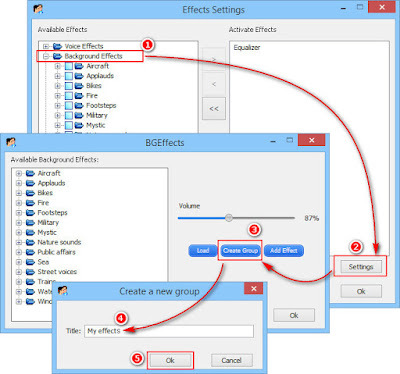 When you apply a certain presets, the settings will be adjusted automatically. You can sound more like Adele, an Asian female, baby girl, a woman with various age ranges, as well as many different voice characteristics such as vocal fry girl, country girl, breathy woman, sweet-voiced girl, etc. And remember, you only need one click to apply the presets. Different from the ready-to-use voice presets, with this feature, you will be able to change voice male to female however you like it - total control of your own voice. To use this feature, there are three areas in the software that should be noted. This is the main tool to change the core value of your voice. With Pitch - Timbre, you will be able to control the gender and age respectively. - Move it to the right: higher Pitch and more feminine. - Move it up: higher Timbre and sound younger. - Move it down: lower Timbre and sound older. That's all there to it. Depending on your voice's characteristics and the target voice, you can move it a round to find the best option. If Pitch-Timbre is the main ingredient, then this will be the spices to your remarkable dish. - Presets: make your voice raspy, weak, trembling, warm, gentle, sharp, tender, breathy, etc. - Voice effects: robot voice, resonance, radio effect, behind the wall, in a big room, etc. - Background effects: aircraft, fire, footsteps, military guns, nature sounds, ocean waves, etc. - Non-human voices: sound like dogs, bear, bird, lion, duck, etc. when you talk. - Equalizer to change various Hz value of the voice, making it different in various ways. If you used to eat at a small food store and a restaurant, if the food both of them serve if equally good, then what is the difference? The last step in finalizing you delicious project, Voice Beautifying is like the decorations and colors to your male to female voice changing process. In short, these values represent the quality of the voice in their frequency range. Making adjustments to these values will make your voice "more colorful", for instance, soft talking, rough, creaky, etc. Thus, you can change your voice to a sweet girl, angry woman or a caring grandma, not just normal male to female voice changing tasks. - Vowel enhancer: the Formant 1 and Formant 2 are the most important to alter the way the vowels are pronounced. In general, they will affect the vowels and to make the voice squeakier, increase the formants’ values. - Smoothing: help you produce softer signals. - Limiter: prevents voice distortion and helps stabilize output. Release: if you hear some sound "croaking", increase this value to weaken the signal. If there is croaking sound, leave it at default. Attack: defines the reaction speed to volume increase if it exceeds the allowable threshold. - Noise reduction: eliminate background noise. Reduction: the amount of noise to be removed. Threshold: the sound below this will be treated as noise. And that's it. If you want to change voice male to female in the most creative way, this is the one for you. There are hundreds of combinations for you to choose and make the most out of your voice.